The world of Blue Moon is in chaos. A clever little card game from Reiner Knizia with a strange, very European, fantasy theme. The base set caters for play between two races, and several more races can be purchased separately. Surprisingly deep if you play often. Recently re-released with all the expansions in one box by Fantasy Flight Games and definitely worth picking up. 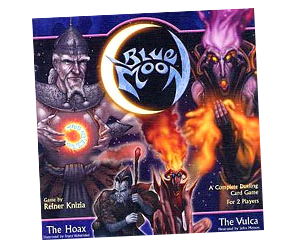 Everything originally released for the game was recently re-released in one box by Fantasy Flight Games as Blue Moon Legends. I’d love to see an updated version of this for Blue Moon Legends (which is basically the same game with all expansions)! I’ve got all the original edition sets so I don’t have any plans to buy the new one. Are there any rules changes? Is a new summary really necessary? While it is not necessary to buy the new edition if you own the old one (although there are two cards available in English for the first time, and the card size is a bit more manageable) the rules themselves are more comprehensive. For instance, during the Leadership phase you may play one Leadership Phase card, which could be a Leadership card or Influence card. It appears as if this rules summary actually only covers the original 8 people decks and not the Emissaries and Inquisitors or Buka Invasion expansions. I would at least take a look at the new rules PDF. It incorporates all the expansion rules and a lot of clarifications from the original FAQ. There’s quite a lot on my plate at the moment but I’l add it to the list! +1 for this but take your time. Thanks for all your hard work.